As is now a tradition, Mario and Sonic characters will cross over in the world of sport for next summer's Olympics, as Mario and Sonic at the Rio 2016 Olympic Games was announced for both Wii U and 3DS today. Although there hasn't been a digital release of a Wii game on Wii U for North America since January, the service is expanding in Japan with a Nintendo classic and the first true 3rd party game. Streetpass is in, as well as Pokemon-Amie. The Nintendo Direct has announced new features for the new Fire Emblem game that use a couple of key 3DS features. A stronghold building mechanic was introduced that will allow you to place shops and homes in the area in between missions. Also featured are hot springs and a Pokémon-Amie like function for your characters. The strongholds can be StreetPassed and invaded as well. Ever wonder what Capcom teaming up with From Software would look like? The Monster Hunter franchise will continue to grow as two new games were announced at a Monster Hunter event in Japan and during today's Nintendo Direct. Gamers in Japan can get down with the good doctor in the latest entry in the series. Happy Home Designer gets a release date, NFC Reader/Writer Bundle, special edition New 3DS XL and more in Japan. Animal Crossing: Happy Home Designer for the Nintendo 3DS and the respective Amiibo cards for the game are set to release on July 30 in Japan. The software will be released both at retail and digitally for 4,000 yen plus tax, while the cards, containing three cards in each pack, will retail for 300 yen per pack. One hundred different cards will be available at launch. A new side scrolling title in the Chibi Robo series is headed to the Nintendo 3DS in Japan this fall. Titled Nagenawa Action Guru Guru Chibi Robo, the game has the tiny robot using his electric cord as a lasso, whip even as a grappling hook to attach to platforms and walls. Japan's next Nintendo Direct presentation has been announced with an unusual time. The video will air at 7pm Japan Standard Time (6am ET / 3am PT) this Sunday, May 31, the first time a major Direct has aired on a Sunday in any territory since the Direct that revealed Miiverse and New Super Mario U in June 2012. We hope this makes up for a lack of TVii. Wii U owners in the UK now have access to the BBC's radio and television streaming service. The BBC iPlayer was originally slated to come to the Wii U at launch, but was held up for reasons unknown before finally being added in today's eShop update for the UK. The service was available on the Wii until service was terminated in February of this year. The last chance for glory, for fun, or to be a filthy scapler. Amazon was the last retailer in the United States to post their availability for the group of Amiibo releasing tomorrow, and they have adopted an unusual release strategy according to an email sent to those who signed up for product notifications. "Kid season!" "Squid season!" "KID SEASON!" "SQUID SEASON!" Of course, there's a giant cephalopod in the room this week in the Nintendo eShop update, and that's Splatoon. Hopefully when the game goes live at midnight, it's more like the first three global testfires instead of the last one's first half. At this point, Humiibo seem like the best option. Today in Nintendo news, we have a shocking development out of the UK, new hotness in Japan and an update for North America Virtual Console users. Everybody wins! 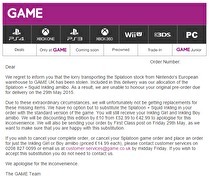 UK retailer GAME is scrambling after a lorry containing their stock of Splatoon limited editions was stolen somewhere between Nintendo of Europe’s distribution centre and their warehouse. The social goals are done, just bring money. 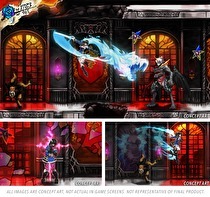 As teased last week, Koji Igarashi's spiritual successor to the Game Boy Advance and DS Castlevania games Bloodstained: Ritual of the Night will come to Wii U if the project reaches US$3m before June 13. A major Japanese release is locked in for a trip across the Pacific and more! Today’s Nintendo news brings word of an anticipated localization, and the Wii U gods giveth and taketh away. A whole bunch of indie hits at a low price. Through June 9 at 1pm ET, North American eShoppers will be able to pay what you want for a group of eShop games and support charity as well through the Humble Bundle. Plus good sales news and download information for our European friends. As the working week begins for the US and UK, some quick news items that broke over the weekend. The last Splatoon Global Testfire this past Saturday did not go according to plan, although a full hour of inking was completed. Some of the puns near the end are ink-onceivable. Nintendo has posted an Iwata Asks article for Splatoon ahead of the game's release. Satoru Iwata sat down with five members of the Splatoon development team to discuss the game's development. The article mentions how the game's director Yusuke Amano designed the E3 reveal trailer from the ground up in order to ensure the vision came directly from the team, and the game originally played with the map on the TV and all action on the GamePad. Today’s Nintendo News includes an unexpected yet appropriate hire and some game announcements. 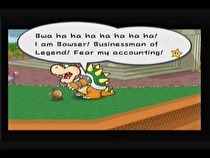 Proving that the economy can affect us all, Nintendo has hired Bowser as a vice president of sales. 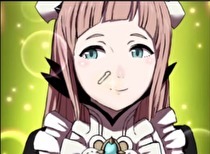 Starring puzzles, dragons, and a most unwanted return. 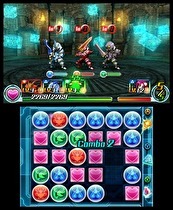 Clearly, the big release of the week for the 3DS eShop is Puzzle and Dragons Z/Super Mario Edition. In fact, the game's been available for preload for a couple of weeks, so you might already have it. For those on the fence, check out the demo and Zach's review to see if it's worth dropping $30/$35 on. The dark side of the Pokémon franchise will release later this year. Nintendo has announced the newest Pokémon spinoff, Pokémon Super Mystery Dungeon, will release later this year. The fifth set of Pokémon Mystery Dungeon games promises a "sweeping tale of adventure and mystery", and based on the previous games will include direct control over the Pokémon.